Collaged photographs and drawings that mine childhood memories, reflecting the volatility of nature, community and identity. 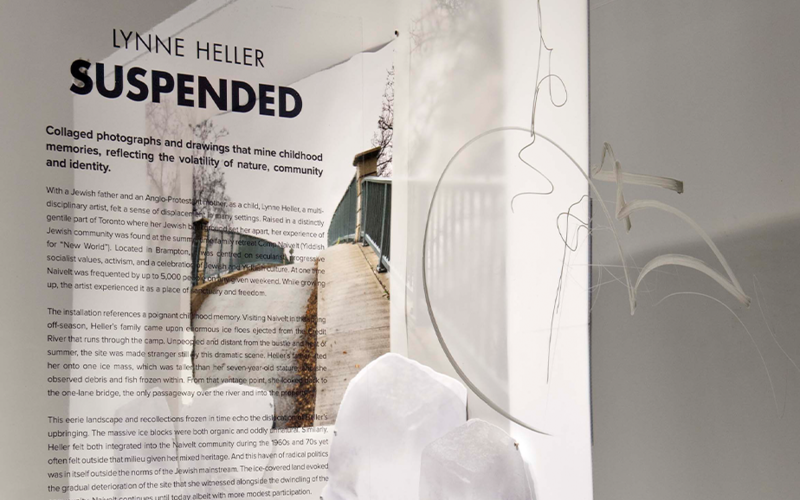 With a Jewish father and an Anglo-Protestant mother, as a child, Lynne Heller, a multi- disciplinary artist, felt a sense of displacement in many settings. Raised in a distinctly gentile part of Toronto where her Jewish background set her apart, her experience of Jewish community was found at the summertime family retreat Camp Naivelt (Yiddish for “New World”). Located in Brampton, it was centred on secularist, progressive socialist values, activism, and a celebration of Jewish and Yiddish culture. At one time Naivelt was frequented by up to 5,000 people on any given weekend. While growing up, the artist experienced it as a place of sanctuary and freedom. 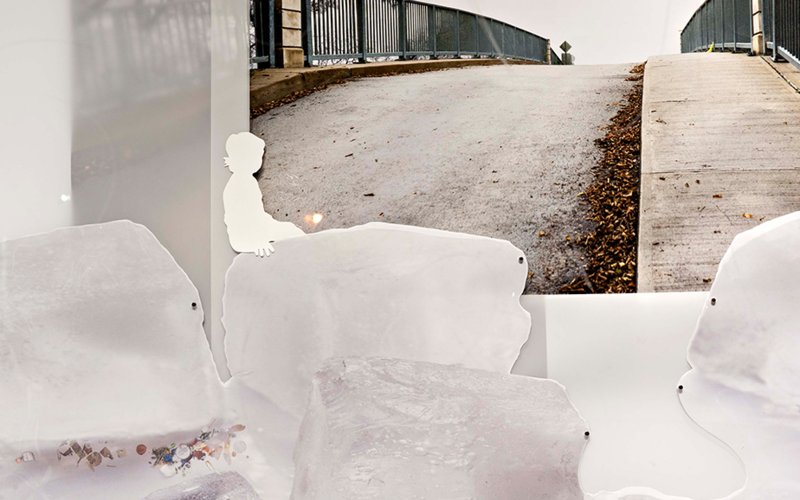 The installation references a poignant childhood memory. Visiting Naivelt in the spring off-season, Heller’s family came upon enormous ice floes ejected from the Credit River that runs through the camp. Unpeopled and distant from the bustle and heat of summer, the site was made stranger still by this dramatic scene. Heller’s father lifted her onto one ice mass, which was taller than her seven-year-old stature, and she observed debris and fish frozen within. From that vantage point, she looked back to the one-lane bridge, the only passageway over the river and into the property. This eerie landscape and recollections frozen in time echo the dislocation of Heller’s upbringing. The massive ice blocks were both organic and oddly unnatural. Similarly, Heller felt both integrated into the Naivelt community during the 1960s and 70s yet often felt outside that milieu given her mixed heritage. And this haven of radical politics was in itself outside the norms of the Jewish mainstream. The ice-covered land evoked the gradual deterioration of the site that she witnessed alongside the dwindling of the community. Naivelt continues until today albeit with more modest participation. In the exhibition, the terrain of memory interweaves with the textures of College Street as perennial graffiti markings on our window enter the piece, linking the past with present-day realities where the artist’s self-conception is firmly grounded. An image of the Naivelt bridge appears, signaling possibilities in connecting two seemingly distinct realms, holding out the potential for crossing into the promise of a new world. Collaborators: Paul Lovejoy (York University), Dean Rehberger (Michigan State University), Mohammed Salau (University of Mississippi), and Abubakar Babajo Sani (Umaru Musa Yar'adua University, Katsina). The trans-Atlantic slave trade was a centuries-long trauma that saw approximately 12.5 million Africans forcibly taken from their homes and transported to work in the emerging plantation societies of the Americas. The trauma of enslavement and sustained repression of language, culture and beliefs blurred memories of origins and birthplaces. 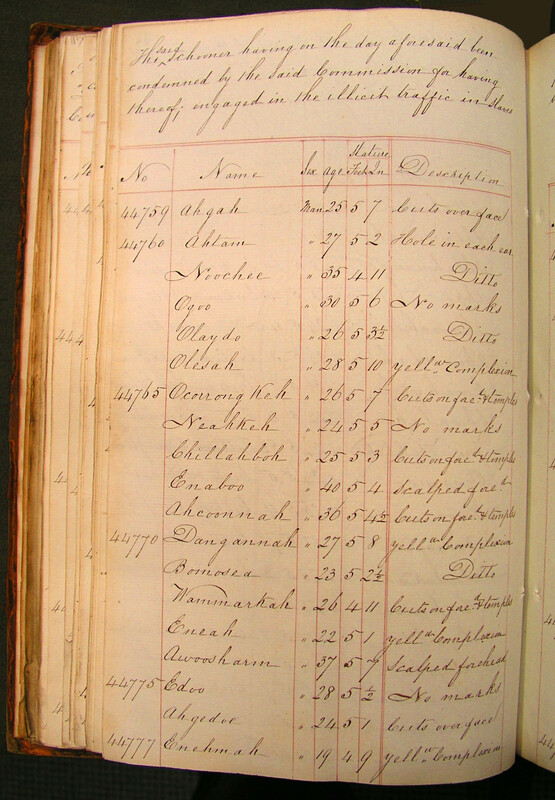 Previous attempts at analyzing large datasets of names recorded in manumission records to unearth individuals and personal histories have been challenged by practices of slave renaming. Drs. Ladly and Keefer will work with their collaborators to develop a searchable visual database using the entries from the 19th century Registers of Liberated Africans to reveal individual identities and origins. Their research includes appropriate methods for collection, analysis and presentation of the sensitive personal information within these datasets. They will design and train an AI model to work in conjunction with ethno-linguistic and visual models, so that researchers and members of the public may extract meaningful information from the data. Working in the Visual Analytics Lab, the OCAD U design team will construct computational architectures for the visual/linguistic database, develop a mathematical model for data analysis, and design dynamic 2D and 3D visual models and user interfaces. 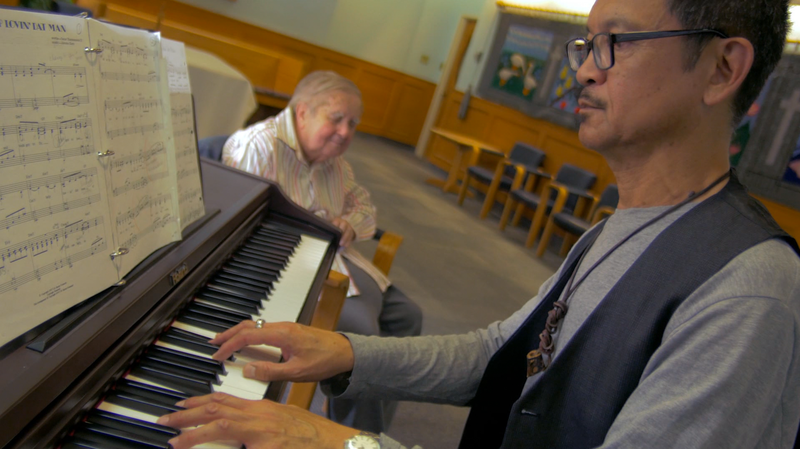 Richard Fung’s RE:ORIENTATIONS brings together a filmmaker, historian, and sociologist to produce a groundbreaking longitudinal documentary film on LGBTQ Asian Canadians covering a 30-year period. It fosters collaborations between community groups and academic institutions and brings critical conversations around sexuality, race, and nation to wider audiences. RE:ORIENTATIONS (2016) revisits the interview subjects of Richard Fung’s 1985 film Orientations: Lesbian and Gay Asians, which was the first documentary on diasporic queer Asians in North America. RE:ORIENTATIONS presents seven surviving subjects of the original documentary with raw interview footage from the 1980s, putting them in dialogue with their younger selves. Their reflections on identity, sexuality, racism, activism, and cultural expression are contextualized through conversations with six younger queer and trans activists, scholars, and artists. The project examines continuities and transformations in identities, political discourses, social processes, and legal frameworks as they relate to the intersecting and continually shifting categories of ‘LGBTQ’ and ‘Asian Canadian’. RE:ORIENTATIONS had its world premiere at Inside Out: Toronto LGBT Film Festival on Saturday May 28, 2016.The film was presented in international LGBT film festivals as well as Asian and Asian diaspora festivals. It has been acquired by university libraries and screened at universities and academic forums. In addition, RE:ORIENTATIONS opened the inaugural Shanghai Queer Film Festival and was the focus of a residency and roundtable at Simon Fraser University, to be published in a peer review journal. Re:Orientations has produced enriched discourse among, and advocacy on behalf of, LGBTQ and Asian/Asian diaspora/Asian Canadian communities. and provided a pedagogical tool for academic institutions and a resource for research. This research was supported by the Social Sciences and Humanities Research Council of Canada. Messenger bags, placemats, hats and totes were on display at Regent Park Proud, an exhibition at the Student Gallery on June 17 and 18. The exhibition is the outcome of the second year Industrial Design class Identity Materialized, led by assistant professor Ranee Lee. Students in the class collaborated with members of a women’s sewing collective in Regent Park to develop prototypes for soft goods that could be fabricated by the collective and sold within and outside the community. Identity Materialized introduces students to the field of design for social change and engages them in experiential learning. OCAD University students had the opportunity to be immersed in the diverse backgrounds of the women from the Regent Park community and work with the Yonge Street Mission on a project that has the potential to reduce poverty on a local scale. Lee and her students thank Zev Farber, manager of the Centre for Emerging Artists & Designers, and OCAD U’s social innovation hub, Impact Collective, for their support with the ambitious project. To learn more about the students and the project read this story in the Toronto Star. K. Jake Chakasim is a lecturer at the School of Architecture where he teaches Architectural Design Studio. His interdisciplinary approach to the profession of architecture addresses the need to re-contextualize Aboriginal traditions through refined typologies. For his efforts, Jake was awarded the Architectural Research Center Consortium (ARCC) Jonathan King Medal for 2010-11, an award that acknowledges innovation, integrity and scholarship in architectural and/or environmental design research. Jake is currently pursuing a PhD in Human Studies at Laurentian University with a focus on the design-based economy of Indigenous communities. (Toronto — May 6, 2011) At last night’s opening celebration of OCAD University’s 96th Annual Graduate Exhibition, the university unveiled its new visual identity to students, faculty, staff and guests. The university’s new logo was developed in collaboration with the internationally respected firm Bruce Mau Design (BMD). “This dynamic new identity asserts OCAD U’s catalytic role within the creative sectors, the research community and industry,” said Dr. Sara Diamond, OCAD University President. BMD worked with the OCAD U community to design an innovative and collaborative process that included participation from students, faculty, staff, community members and alumni from across Canada and around the world. 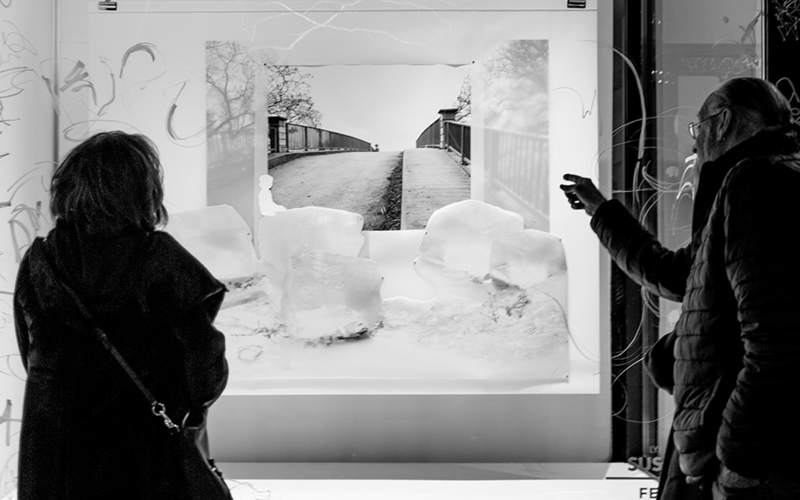 The design process included a series of workshops last fall, where participants were invited to share their stories, experiences and ideas about OCAD U and what they envision for the university in the future. 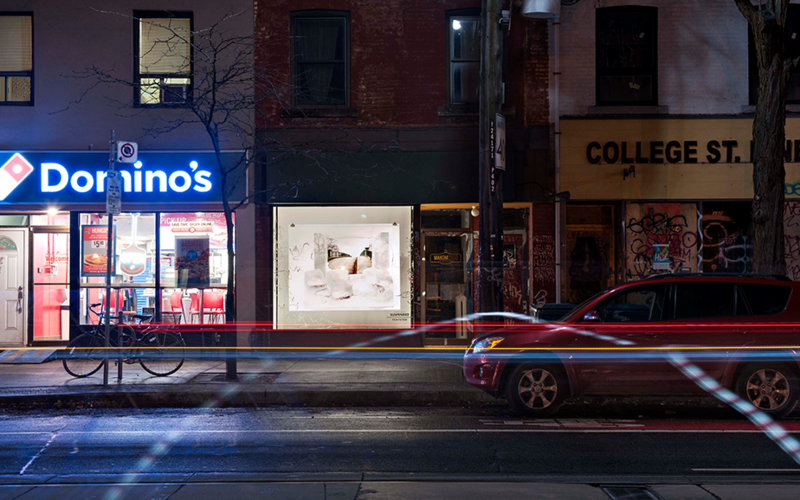 Inspired by OCAD U’s iconic and transformational Alsop-designed Sharp Centre for Design, BMD created a base of black and white pixel ‘windows’ — modular frames to hold actual student art and design work. Through these ‘windows’ the core of OCAD U is presented —conceptually strong, relevant, diverse, and compelling. “As we push the boundaries of art and design practice, education and research, so too does our new identity, giving the world a window into what we do here,” said Dr. Diamond. The identity is dynamic and modular in design. Every year, graduating student medal winners will be invited to design a logo within the basic window framework, providing the university with a set of logos for that year. As OCAD U grows and matures, a living library of identities will emerge, recording the ideas and aesthetics that have shaped our culture over time. 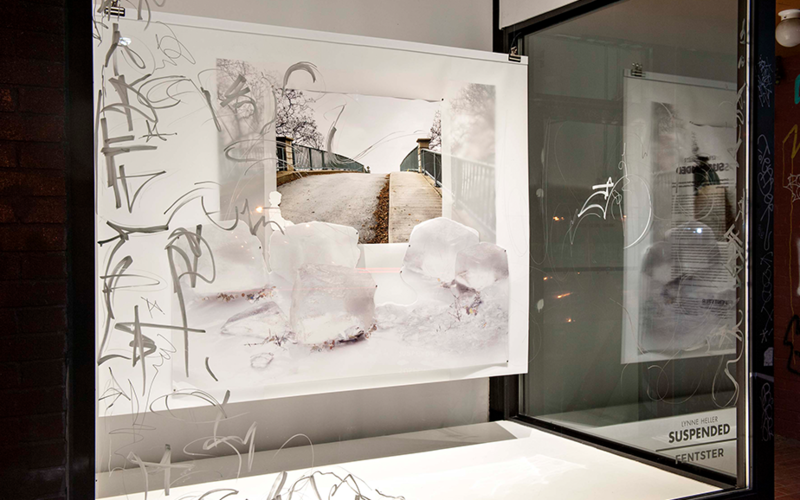 Last night’s unveiled logo ‘window’ featured works by 2010 medal winners Adrian Forrow and James Gauvreau. This year’s medal winners were announced earlier this week as part of the lead up to this weekend’s Graduate Exhibition, which continues until Sunday at 6 p.m. Each medal winner will be invited to participate in the program to feature their work in the new identity going forward. The unveiling kicks off a summer-long implementation process for the new identity. “We plan to welcome our next cohort of new students this September with our new look fully realized across campus,” said Dr. Diamond. Bruce Mau Design (BMD; www.brucemaudesign.com) is an innovation and design studio centred on purpose and optimism. Since 1985, BMD has evolved from a graphic design studio to a leader in breakthrough design thinking, applying design methodologies to a wide range of business and cultural organizations with challenges in need of creative solutions. Creators of Massive Change®, the internationally acclaimed travelling exhibition, book, website and interview series, BMD is an interdisciplinary studio made up of artists, architects, graphic designers, filmmakers, brand strategists, biologists, publishers, curators and technologists. Some of the firm’s clients include: MTV, AGO, Coca-Cola, Arizona State University, MoMA and the feature length documentary The 11th Hour. BMD is a member of the MDC Partners network. OCAD University (www.ocad.ca) is Canada’s “University of the Imagination.” The University, founded in 1876, is dedicated to art and design education, practice and research and to knowledge and invention across a wide range of disciplines. OCAD University is building on its traditional, studio-based strengths, adding new approaches to learning that champion cross-disciplinary practice, collaboration and the integration of emerging technologies. In the Age of Imagination, OCAD University community members will be uniquely qualified to act as catalysts for the next advances in culture, technology and quality of life for all Canadians. Download this release as a PDF file.